The Untouchables is a highly entertaining – yet highly fictionalized – saga of the successful legal campaign to bring down Al Capone’s criminal enterprise that terrorized Chicago through the 1920s with an all-star cast including Robert De Niro as Capone himself. Eliot Ness had made a name for himself in the final years of Chicago’s beer wars as a relentless Prohibition agent, and he would use his fame decades later to pen The Untouchables, a memoir in which he credits himself with practically single-handedly sending Capone to prison. In real life, Ness’ raids were indeed disruptive, but it was the work of modest investigators U.S. Attorney George E.Q. Johnson and IRS agent Frank Wilson that eventually led to the charges that successfully convicted Capone. In 1987, Brian De Palma helmed The Untouchables, reinvigorating interest in Ness’ self-promoted campaign against Capone. 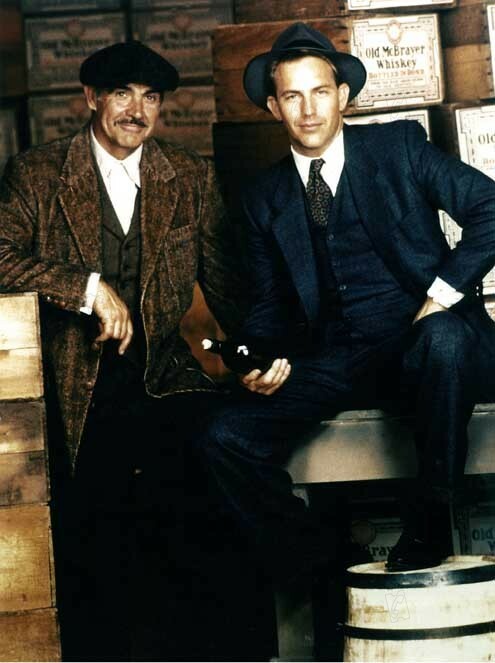 Essentially a reboot of the spirit of the TV show rather than a straight retelling of the actual facts, the film starred Kevin Costner as the bright-eyed and earnest Eliot Ness, hapless in the face of Chicago’s corrupt legal system that allows – if not encourages – Capone to succeed. Ness encounters tired old Irish beat cop Jim Malone (Sean Connery), who thoroughly impresses him as the last uncorruptible figure in the city’s law enforcement structure. Malone binds Ness into a “blood oath” to bring down Capone – it was Connery’s idea to film this scene in a church – and the two form the nexus of the four-person Untouchables that are unbribable and unstoppable as they bust Capone’s illegal liquor industry and build their case with plenty of bullets and blood along the way. As a cynical old-timer, Malone sports a scrappier look than the sharp Armani suits worn by Kevin Costner’s ambitious Eliot Ness. 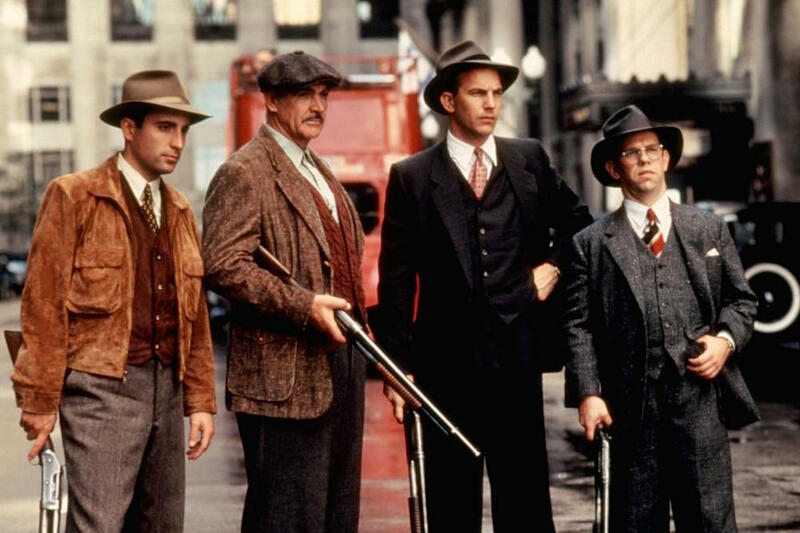 In fact, costuming informs plenty about the characters of The Untouchables. Ruthless mob enforcer and death-dealer Frank Nitti wears a white suit that recalls the “pale horse” of Revelations as hell follows him through Chicago; treasury agents Ness and Wallace wears gray business suits as they go about their jobs while honest cops Stone and Malone are grounded in earth tones. The Untouchables: George Stone (Andy Garcia), Jim Malone (Sean Connery), Eliot Ness (Kevin Costner), and Oscar Wallace (Charles Martin Smith). Malone’s base outfit is a thin-waled corduroy jacket, pale shirt buttoned to the neck, odd vest, brown wool trousers, ankle boots, and tweed newsboy cap, all in various earth tones that evoke his ruggedness. The Norfolk-inspired sport jacket is constructed of pale brown corduroy cotton. The soft, uneven texture of the jacket leads many to speculate that it is tweed, but close-ups, production stills, and auction photos verify that it is indeed corduroy, albeit a very fine needlecord. Malone isn’t above injecting some racism into his job interviews to see how applicants respond to ethnic slurs. It’s effective but not recommended. The jacket’s notch lapels roll just over the top button of the closely-spaced three-button front stance. All of the jacket’s buttons – the three on the front, the three smaller ones on each cuff, and each pocket flap button – are brown woven leather. The shoulders are softly padded with minimal roping at the sleeveheads; the position of the sleeveheads just off the shoulder indicates that the jacket is slightly oversized. About to give the Capone organization its first black eye in quite some time,.. The three outer pockets are patch-style pockets with an open-top, rounded-bottom breast pocket and pointed flaps that button to close each of the large hip pockets. While lacking details like the front box pleats and full belt, Malone’s jacket takes some inspiration from traditional Norfolk jackets and hunting coats, appropriate for an old-school cop who certainly knows his way around a mahaska. The back shoulder yoke comes to a point in the center, just above an inverted box pleat that adds a few extra inches to Malone’s range of motion. The ventless back is half-belted, with the center pleat traveling the entire length between the pointed yoke and the belt. Stone’s recruitment doesn’t go quite as Ness would have expected, but as long as Malone is happy, that’s all that really matters. Malone’s light brown tick-checked wool vest is single-breasted with long low-gorge notch lapels and six closely-spaced buttons down to the notched bottom, which ends high on his waist to accentuate Connery’s leg length without lengthening or drawing attention to his torso. There are two welted pockets at the hips, and he wears his silver chain with his call-box key and his medallion of St. Jude, the patron saint of lost causes, clipped to the left pocket. The tan sateen back has an adjustable strap. Malone’s usual shirt is a pale green cotton shirt from R&O Hawick (not “Harwick” as misspelled in an auction listing) with a large semi-spread collar and rounded cuffs with clear plastic buttons that match those down the wide edge-stitched front placket. When not wearing a tie, Malone typically wears his shirt buttoned up to the neck. A moment of trepidation before the raid… followed by exuberance and celebration after its success. The only time he does wear a tie is his celebratory dinner with Ness, Wallace, and Stone after their first successful raid, when he sports an olive-and-tan large-scale plaid tie with tonal overchecking, tied in a small four-in-hand knot with the wide, ’30s-style blade hanging free. Note the suspenders and belt… apparently Malone’s trousers need a good deal of help staying up! 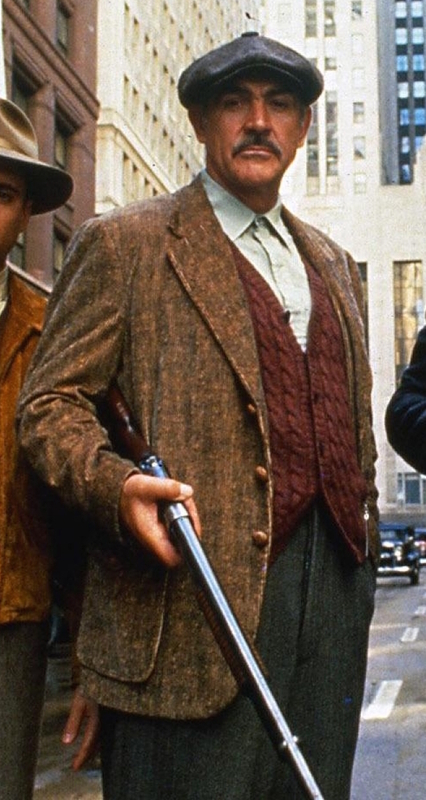 During this dinner and several other early scenes in The Untouchables, Malone wears a brick red Aran knit wool sleeveless cardigan sweater with five dark corozo buttons, a notched bottom, and two welted pockets at the hips, wearing his silver chain similarly clipped to the left pocket. Shotgun in hand, Malone leads his raiders. For his final day on screen, Malone appears to be wearing a pale blue shirt, similarly styled to the pale green shirt with its large semi-spread collar, but with double (French) cuffs where he wears a set of plain gold square links. Malone’s final moments with fellow Untouchables. Malone wears a pair of double reverse-pleated brown herringbone wool trousers that rise high under his waistcoat. They have a button fly and straight pockets along the side seams but no back pockets. The bottoms are finished with turn-ups (cuffs). Evidently, Malone requires both a belt and suspenders to hold up his trousers. His belt is plain black leather with a simple steel single-prong buckle. Malone often opts for varieties of blue and gray striped braces, but his best-seen (and final) suspenders consist of two gray stripes on a duller blue cloth, with each gray stripe bisected by a thin scarlet red stripe. The suspenders button to the inside of his trouser waistband with black leather double-ears. A “boots on the ground” man of action like Malone naturally wears a pair of ankle boots consistent with his ruggedly urban outfit. The dark brown leather cap-toe boots have derby-style open lacing with one lace from each boot tied around the throat to keep them secured over his ankles, further signifying that Malone is an old-timer who knows (and does) what works for him specifically. Malone wears black socks with his boots. It takes more than the entire fifty-round drum of a Thompson submachine gun to keep Malone down… at least in the short term. Malone tops off his modest attire with that most earthy of 1930s headgear, a wool newsboy cap. The mixed dark brown tweed cap reflects the earth tones of the rest of his outfit, and it is differentiated as a newsboy cap (rather than a standard flat cap) with the eight panels connected under a tweed-covered top button. The auctioned cap is listed as an “AKERI Sportsman Extra Quality” snap cap, but – like the boots – I haven’t been able to learn more information about this manufacturer. As I’ve mentioned throughout this post, most of Malone’s costume was auctioned in December 2005 by Profiles in History, as found here. Evidently, the clothing had traveled through several auctions, including an original Paramount auction in 1990 by Christie’s East. This civilian ensemble consists of a light brown textured corduroy jacket with woven leather buttons and two front pockets;a pair of brown textured wool trousers with button front closure, handwritten in the waistband “Malone-A”; a pale green cotton shirt with R&O Harwick [sic] label; a textured brown wool vest; tweed wool snap cap marked “AKERI Sportsman Extra Quality” and a pair of brown leather ankle boots with perforated detailing and Aventura Label. Originally offered at the 1990 Christie’s East sale of Hollywood memorabilia featuring items from Paramount Pictures. An image of the auctioned outfit, sourced from PropArchives.com, can be seen on the right. It’s been suggested that Sean Connery eschewed the Armani clothing sported by other characters in the film, instead opting for his personal tailor to create much of the clothing he wears in The Untouchables. As no labels are described in any of the tailored items that were auctioned – jacket, waistcoat, and trousers – it’s more than likely that these were indeed custom-made for Connery. Early in the film, Malone bemoans to Ness that he is “just a poor beat cop,” and he certainly dresses the part with a functional mishmash of earth tones in rugged fabrics like corduroy, tweed, and textured wool. For fancy occasions, maybe a dinner out with fellow gun-toting liquor raiders, Malone wears a brick red sleeveless cardigan sweater with a plaid tie. You carry a badge? Carry a gun. It’s no surprise that Malone is so eager to thrust a gun into Oscar Wallace’s inexperienced hands as Malone is certainly an expert when it comes to firearms and using them as an effective tool in law enforcement. Malone’s preferred sidearm is a Smith & Wesson Model 10 – then known simply as a Smith & Wesson “Military & Police” revolver – in .38 Special. The Model 10, renamed in the late 1950s when Smith & Wesson standardized its numbered model system, was the police revolver throughout the 20th century. He carries a standard blued model with a four-inch barrel and walnut grips, usually tucked into the left side of his waistband. The fact that the Chicago Police Department issued a Colt Police Positive during this era and Malone’s questionable use of the weapon – both to shoot a dead gangster in the mouth and to threaten his own captain – suggest the possibility that the Smith & Wesson is Malone’s personal handgun. Malone finds plenty of opportunities to draw his service revolver… even on his own corrupt captain. When a raid is in order, Malone doesn’t hestitate before reaching into Ness’ office weapons cabinet to issue Winchester Model 1897 riot shotguns to the team. Introduced in 1897 (as you may have guessed), the Winchester Model 1897 was the first successful pump-action shotgun, designed by John Browning as a tougher improvement on his earlier Winchester Model 1893 as well as the Spencer pump shotgun developed in the 1880s. The trench model, essentially a riot-length Model 1897 with a bayonet leg, found success in the hands of American troops during World War I, where its devastating impact and six-shot capacity led to an unsuccessful attempt by the Germans to have it outlawed in combat. A distinctive feature of the Winchester Model 1897 that differentiates it from the later Winchester Model 1912 is the Model 1897’s external hammer system and lack of a trigger disconnector, which allows a user to hold the trigger down while cycling the shotgun to fire the shotgun each time the action is returned to battery… similar to fanning the hammer of a single-action revolver. Available in 12-gauge and 16-gauge, the Model 1897 was continually produced for sixty years until hammerless shotguns like the Model 1912 and Remington Model 870 superseded its popularity. Malone delivers a 12-gauge message to the Capone organization. Malone also made an impression on screen with the brutal-looking lupara kept in his phonograph cabinet for home defense. Thanks to IMFDB, we know that this short-barreled 12-gauge double-barreled shotgun was a Rossi Overland and had been built for Ellis Mercantile by the late gunsmith Branko Wohlfahrt. Ellis Mercantile supplied weaponry for The Untouchables and thus Malone found himself frequently armed with this sawed-off shotgun. In a twist of irony, Malone makes a disparaging remark about the Italian assassin ostensibly “bringing a knife to a gunfight” while himself armed with a lupara. The lupara was traditionally associated with the “old world” Cosa Nostra for its frequent use in Sicilian vendettas, gaining particular attention in the United States after the 1890 murder of New Orleans police chief David Hennessy was widely reported at the time to have been committed by shotgun-wielding mafioso and led to intense anti-Italian sentiment and the largest reported mass lynching in American history. Malone knows that a gun is the only appropriate weapon for a gunfight. The Rossi Overland wasn’t manufactured until 1978, but it is cosmetically similar enough to shotguns of the late 19th century that this would hardly define it as an anachronism and it has also found use in period productions like Mobsters and Deadwood. No Prohibition-era gangland epic set in The Windy City would be complete without extended use of the Thompson submachine gun, the .45-caliber weapon that gained a reputation as “the gun that made the twenties roar.” Of the Untouchables, only Malone and Stone make use of the “Chicago typewriter” which, despite its nickname, is most frequently handled by the men during their mission on the Canadian border. You wanna know how to get Capone? They pull a knife, you pull a gun. He sends one of yours to the hospital, you send one of his to the morgue. That’s the Chicago way!